"How To Install Virtually ANY Script On Your WebSite Yourself and Save Tons of Cash – Today!" 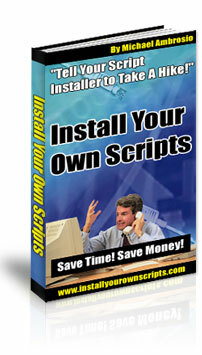 You'll discover what script installers hoped you'd NEVER learn. Just how SIMPLE it is to install virtually ANY Perl or PHP script on your website. Once you get this Incredible ebook you will have all the confidence to install your scripts yourself from that moment forward! Once you read this step-by-step guide to installing scripts, you'll wonder why you've been paying others to do it for you. In fact, you'll be astonished at how easy it really is! Stop Paying Others to Install Your Scripts! Super Bonus #1: Now, what good is learning how to install scripts if you don't have any scripts? So, I gathered a few free – but very good scripts for you to practice installing – AND that you can use! Super Bonus #2: You know that Form Building tutorial I give away from this site? Well, it's included as a PDF ebook/report. It's all inclusive, so you don't have to wait for days to get through the entire thing! Before You Purchase: This ebook was written as an instructional guide for installing scripts on Unix servers. It also focuses heavily on hosting accounts utilizing CPanel software and MySQL databses. It does NOT cover Microsoft servers. Retail Value of just the ebook is $67.00 but you pay just $1.00 for the entire package!